Smartland Body Block Arcade Apartments is an historic all brick Queen Anne style apartment complex in Cleveland, Ohio. The building has undergone recent and extensive modern renovations. Located in Mid-Town at the corner of E. 55th and Payne Avenue, both 1 bedroom and 2 bedroom rental units are available for immediate occupancy. With convenient access to OTC (Ohio Technical College), every unit has newly renovated flooring and an accommodating large living area. Modern kitchen design includes built-in cabinets and new countertops. Kitchens are also furnished with a modern stainless steel refrigerator and stainless steel range with fan exhaust along with a new double sink and faucet. The renovated bathrooms includes a contemporary vanity and mirror along with newly installed light fixtures, toilet and shower tile. Pet lovers at Body Block Arcade can also enjoy sole access to our newly completed pet park. 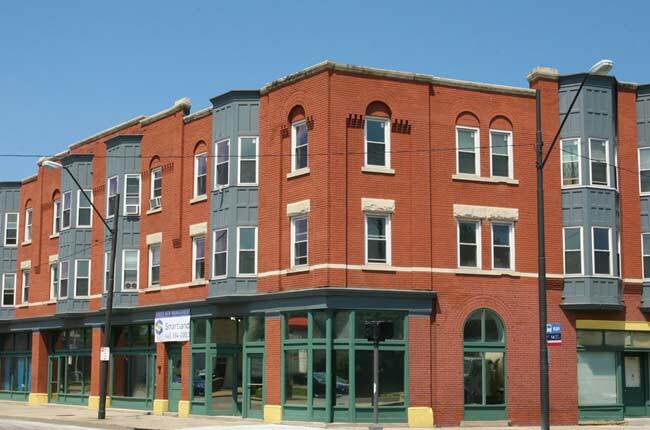 Smartland Body Block Arcade Apartments is mere minutes from both central Downtown and Lake Erie. Convenient shopping is a few miles away for a number of shopping malls including Park Centre, Asia Plaza, Tower City Center and The Arcade. Catch the latest blockbuster movie at Great Lakes Theatre only 10 minutes nearby. Popular eateries such as Han Chinese Kabob and Grill, Miega Korean Barbeque, Map of Thailand, Burger Kind and Subway are in the local vicinity. Eating at home is simple with nearby markets such as Aldi, and Gust Galluci’s Italian Foods & Market. Everything you need is close by here at Smartland Body Block Arcade Apartments. Discover more about Midtown Cleveland.